Ձեռքբերովի իմունիտետի գլխավոր ֆունկցիաներն են. ↑ Steele, E.J. Mechanism of somatic hypermutation: critical analysis of strand biased mutation signatures at A:T and G:C base pairs. Mol Immunol. 2009;46:305–320. ↑ Peled, J.U., Kuang, F.L., Iglesias-Ussel, M.D., Roa, S., Kalis, S.L., Goodman, M.F. et al, The biochemistry of somatic hypermutation. Annu Rev Immunol. 2008;26:481–511. ↑ Oltz, E.M., Osipovich, O. Targeting V(D)J recombinase: putting a PHD to work. Immunity. 2007;27:539–541. ↑ 6,0 6,1 Madame Curie Bioscience Database [Internet].Austin (TX): Landes Bioscience; 2000-. ↑ 7,00 7,01 7,02 7,03 7,04 7,05 7,06 7,07 7,08 7,09 7,10 7,11 7,12 7,13 7,14 7,15 7,16 7,17 7,18 7,19 7,20 7,21 7,22 7,23 7,24 7,25 7,26 7,27 7,28 Janeway, C.A., Travers, P., Walport, M., and Shlomchik, M.J. (2001)։ Immunobiology (5th ed. )։ New York and London: Garland Science։ ISBN 0-8153-4101-6 . ↑ Dustin, M.L. The cellular context of T cell signaling. Immunity. 2009;30:482–492. ↑ Chatila, T.A. 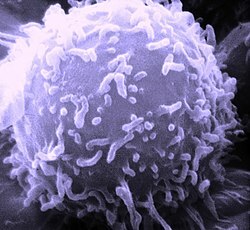 Role of regulatory T cells in human diseases. J Allergy Clin Immunol. 2005;116:949–960. ↑ Richards, S., Watanabe, C., Santos, L., Craxton, A., Clark, E.A. Regulation of B-cell entry into the cell cycle. Immunol Rev. 2008;224:183–200. ↑ LeBien, T.W., Tedder, T.F. B lymphocytes: how they develop and function. Blood. 2008;112:1570–1580. ↑ Conley, M.E., Dobbs, A.K., Farmer, D.M., Kilic, S., Paris, K., Grigoriadou, S. et al, Primary B cell immunodeficiencies: comparisons and contrasts. Annu Rev Immunol. 2009;27:199–227. ↑ 16,0 16,1 16,2 The NIAID resource booklet "Understanding the Immune System (pdf)". ↑ Microbial Ecology in States of Health and Disease: Workshop Summary. Forum on Microbial Health; Board on Global Health; Institute of Medicine. Washington (DC): National Academies Press (US); 2014 Feb 18. ↑ Spencer LA, Weller PF. (2010) Eosinophils and Th2 immunity: contemporary insights. Immunol Cell Biol. 88(3):250-6. ↑ Front Immunol. 2015 Sep 11;6:469. doi: 10.3389/fimmu.2015.00469. eCollection 2015. 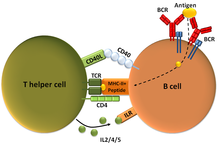 Induction of Regulatory T Cells by Intravenous Immunoglobulin: A Bridge between Adaptive and Innate Immunity.Kaufman GN, Massoud AH, Dembele M, Yona M, Piccirillo CA, Mazer BD. ↑ Weinstein JS, Hernandez SG, Craft J. 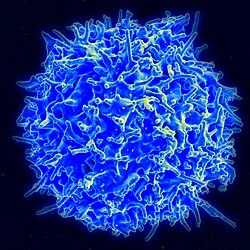 (2012) T cells that promote B-Cell maturation in systemic autoimmunity. Immunol Rev. 247(1):160-71. ↑ 21,0 21,1 Immunobiology: The Immune System in Health and Disease. 5th edition Janeway CA Jr, Travers P, Walport M, et al.New York: Garland Science; 2001. ↑ Front Immunol. 2015 Sep 8;6:456. doi: 10.3389/fimmu.2015.00456. eCollection 2015. Development and Function of Protective and Pathologic Memory CD4 T Cells. Jaigirdar SA, MacLeod MK. ↑ Cooper, M.D., Alder, M.N. The evolution of adaptive immune systems. Cell. 2006;124:815–822.